Indian village ecosystems are diverse with respect to population pressures, agricultural activities and production, livestock composition, energy sources, economics and infrastructural capabilities. Natural resource degradation is a major global concern and the factors and processes leading to degradation are regional and scale up from the micro levels such as village ecosystems. There is need for integrated multidisciplinary approaches for monitoring the resource status and environmental issues at the decentralized level. This paper presents an approach to assess village ecosystems using a set of key indicators developed and tested across fourteen diverse village ecosystems of the Southern India. The concept of ecosystem services associated with village ecosystems of India has been described and adopted to identify indicators and assess issues and trends. Comparison across villages has been demonstrated and the indicators successfully reflected the key environmental issues at each village level as well as differences across villages. We also report unique cases of stabilized land use and ‘desakota-like’ trends from village ecosystem studied. Global Environment Outlook (GEO-4). (2007). 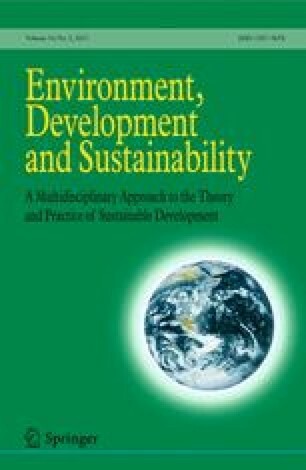 Chapter 6, Sustaining a Common Future (http://www.eoearth.org/article/Global_Environment_Outlook_(GEO-4):_Chapter_6). USAID Policy paper: Environment and Natural Resources. (1998). http://www.usaid.gov/policy/ads/200/envirnat/envirnat.pdf. Village natural resource monitoring (Reports): http://ces.iisc.ernet.in/ravi/vnrm/SoENR.html.